Definition at line 167 of file llvoavatar.h. Definition at line 227 of file llvoavatar.h. Definition at line 237 of file llvoavatar.h. Definition at line 234 of file llvoavatar.h. Definition at line 204 of file llvoavatar.h. Definition at line 207 of file llvoavatar.h. Definition at line 8731 of file llvoavatar.cpp. Definition at line 8736 of file llvoavatar.cpp. References mAttachmentInfoList, mDriverInfoList, mLayerInfoList, mMeshInfoList, mSkeletalDistortionInfoList, mTexEyeColorInfo, mTexHairColorInfo, and mTexSkinColorInfo. Definition at line 9053 of file llvoavatar.cpp. 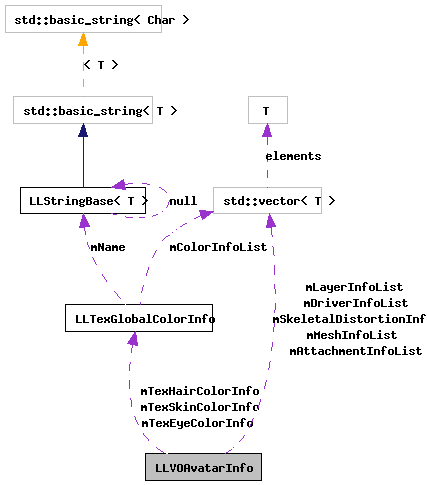 References LLXmlTree::addAttributeString(), FALSE, LLXmlTreeNode::getChildByName(), LLXmlTreeNode::getNextNamedChild(), llendl, llwarns, mTexEyeColorInfo, mTexHairColorInfo, mTexSkinColorInfo, LLTexGlobalColorInfo::parseXml(), and TRUE. Definition at line 9139 of file llvoavatar.cpp. References FALSE, LLXmlTreeNode::getChildByName(), LLXmlTreeNode::getNextNamedChild(), llendl, llwarns, mDriverInfoList, and TRUE. Definition at line 9115 of file llvoavatar.cpp. References FALSE, LLXmlTreeNode::getChildByName(), LLXmlTreeNode::getNextNamedChild(), llendl, llwarns, mLayerInfoList, and TRUE. Definition at line 8963 of file llvoavatar.cpp. References LLXmlTree::addAttributeString(), f, FALSE, LLXmlTreeNode::getChildByName(), LLXmlTreeNode::getNextNamedChild(), llendl, llwarns, mMeshInfoList, LLPolyMorphTargetInfo::parseXml(), and TRUE. Definition at line 8857 of file llvoavatar.cpp. References LLXmlTree::addAttributeString(), FALSE, LLXmlTreeNode::getChildByName(), LLXmlTreeNode::getFastAttributeBOOL(), LLXmlTreeNode::getFastAttributeS32(), LLXmlTreeNode::getFastAttributeString(), LLXmlTreeNode::getFastAttributeVector3(), LLXmlTreeNode::getNextNamedChild(), llendl, llwarns, mAttachmentInfoList, mSkeletalDistortionInfoList, LLPolySkeletalDistortionInfo::parseXml(), and TRUE. Definition at line 169 of file llvoavatar.h. Definition at line 228 of file llvoavatar.h. Referenced by LLVOAvatar::loadSkeletonNode(), parseXmlSkeletonNode(), and ~LLVOAvatarInfo(). Definition at line 238 of file llvoavatar.h. Referenced by LLVOAvatar::loadAvatar(), parseXmlDriverNodes(), and ~LLVOAvatarInfo(). Definition at line 235 of file llvoavatar.h. Referenced by LLVOAvatar::loadAvatar(), parseXmlLayerNodes(), and ~LLVOAvatarInfo(). Definition at line 205 of file llvoavatar.h. Referenced by LLVOAvatar::loadMeshNodes(), parseXmlMeshNodes(), and ~LLVOAvatarInfo(). Definition at line 208 of file llvoavatar.h. Definition at line 232 of file llvoavatar.h. Referenced by LLVOAvatar::loadAvatar(), parseXmlColorNodes(), and ~LLVOAvatarInfo(). Definition at line 231 of file llvoavatar.h. Definition at line 230 of file llvoavatar.h.